You may have no logo for your promotional items or you are a private person and would like to embroider your name in fine form on your towels in order to give it a personal touch? 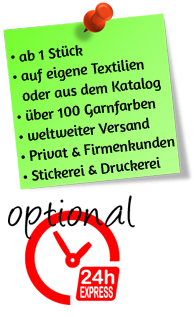 We will send you an offer for some suggestions for your logo and the layout of your individual embroidery! The embroidery will first occur, of course, when you are satisfied with the draft and, of course, you will get the print file for reprints. In the event that we get your finished file via email, it will be reviewed by us of course, free and in case of problems, we can give you feedback! After fixation and preservation of the finished print file we send them immediately to the embroidery. In the meantime, an embroidery card is made in an embroidery program. It presents a price which depends on the size and complexity of your desired embroidery. This price for this stick card is a one-time fee and can be reused for all follow-up orders! In addition, the embroidering comes from our stitchery, where the price is summed per 1000 stitches. The amount of the order is up to you, but we can provide even better prices for large quantities! Contact us with your ideas and wishes, we are looking forward to provide you with advice and a personal offer! Do not shy away from performing comparisons with other companies that are active in the field of embroidery! You will see - we are the right contact for you! We offer many years of experience in graphics, illustration and web design. See our website (web design) www.traumportal.at - our customers include: Schloss Schönbrunn, Meinl am Graben, home of the sea, halloween.at, etc.! Premium class logo design creation. You want to supply your company textiles (work wear) with the perfect logo or design? Your garments are optically improved and given a certain flair with the help of embroidered logos. Custom design.